Our big news for the day is the launch of a brand new website joining the Daemons Media family: Introducing WEB SERIES CHANNEL. As the name suggests, Web Series Channel will be focused on web series. 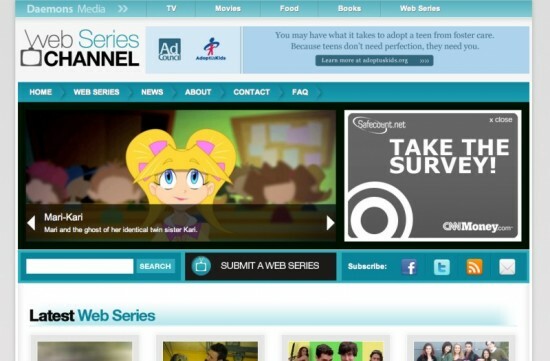 It is an online database of information related to web series. Our mission with this website is to provide a one stop shop to watch the latest and most popular web series online. We also have a neat FAQ page that will answer any questions you might have and if you’re still not satisfied, you can always contact us. And to keep you up to date with everything that is going on, you can subscribe to the Web Series Channel RSS Feed or Email Newsletter. You can also find us on Facebook and Twitter. And finally, you can find the latest additions to the Web Series Channel at the bottom of all the websites accross the Daemons Media Network. We hope you enjoy Web Series Channel as much as we do. So go check out your new hang out spot on the internet.